Above: Barry greasing me up before the longest swim of my life (so far!). We arrived at Dover harbour on a dull, grey Saturday morning (May 26, 2007) after our 140 mile journey and parked in one of three empy spaces near to where we swim. My coach, John Stemp came down for the first time, and my wife Beccy (who is no longer The Mayor after handing over the title last week but we won't go into that!). We wandered off to get a coffee, and when we came back, all the spaces were gone. I noticed the General's car with what appeared to be smoke coming out of the windows. On moving closer, she opened the window and made the polite point that she had lots of equipment and there was nowhere for her to park. I offered to move and let her have my space, but she zoomed off and next time I looked around, one of the cars was gone, and she was parked in front of me. To this moment in time I am baffled how she did that! FOR THE RECORD EVERYONE - Freda has lots of kit, and we all sod off before she does so LEAVE HER A SPACE IF YOU GET THERE EARLY. I have put that in my little book of Fredaisms. Anyway. The swim. "Hoffy. Red hat. 3 Hours" she said. I love her to bits. She's great! The water temperature, according to the Sandettie light ship in the channel, was 55.4 degrees Fahrenheit (13 degrees Centigrade). I thought "Great. It's one degree warmer than last time". Barry greased my armpits (see photo above), between my upper thights, and my chin/shoulder just in case I get a rash from my chin stubble (no comments please). I walked down to the water's edge, took off my flip flops and got in. Bloody hell it was cold! It really felt cold. I started to swim and got my breath, then eased into my stoke. Mmm. I was still cold. No getting away from it, it was cold. "How was I going to last 3 hours in this" I thought? It was 1 degree warmer than two weeks ago, but it felt colder. After 2 hours, I was swimming along minding my own business and was now thinking to myself, "Bloody hell this is cold". No change there then. I swum towards the shore, John Stemp, Beccy and Cliff Golding were there with our feeds. Beccy lobbed it into the water and I started to drink my Maxim. "It's really cold today" I said to Cliff Golding. "It's the wind" making it colder he said. That made sense. Two weeks earlier, the sun was on my back, and I had got a bit sunburnt at 12 degrees water temperature. Today at 13 degrees and a cold wind. I was freezing. 1 hour later, at 3 hours in the harbour. I swum towards shore thinking "Bloody hell I'm cold". But I had done it! I had swum for three hours in a cold Dover harbour as requested. I can't wait now for next week. When I got home, after Beccy and John snoring their heads off in the car while I drove back another 140 miles, I went onto Microsoft Map I worked out how far I had swum that day. Based on the distances in the harbour given by the afore mentioned, I swum about 14,000 Metres! This was the longest and furthest I have swum so far, which meant I have swum over 32KM this week. HOWEVER - When Mark Robson, e-mailed me the Google version of the above, I noticed that the Microsoft Version does not include the Eastern Dock! Re-calculating quickly to include the Eastern Dock, the distance I swum was about 8,825 Metres - a big difference, so beware on using Microsoft's distances. This was still my longest swim, and the total distance for the week is just over 27KM. Above: Dover Harbour swimmers area. 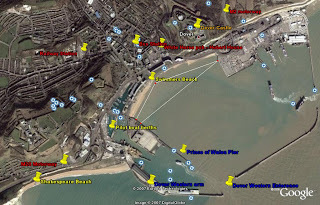 Prince of Wales pier to Swimmers beach = 475 Metres. Swimmers beach to Eastern dock wall = 770 Metres. Prince of Wales Pier to Eastern dock wall, direct route across the harbour = 1,150 Metres.